Consumers today have become distrustful of large corporations and the executives that run them. According to a Gallup poll from June 2013, following the financial crisis of 2007-2009, only 22% of Americans had a significant level of confidence in big business. As you may have noticed, the financial meltdown has been followed by misguided marketing and advertising campaigns that use new logos and celebrities to promote messages that attempt to change consumer attitudes, but has fallen short of delivering real alignment with the consumer’s desire for trust and promise. The goal of brand alignment should be to connect your brands messaging with your customers needs and trust, then fulfill their needs and deliver on the message through their direct experience with your brand. In other words, the emotional connection with a brand is initially derived from the marketing message, but then grows and is sustained based on the actual experience the consumer has when interacting and/or doing business with your brand. When brand messaging aligns with the actual customer expectation and ultimate experience, the result is trust, loyalty and a willingness for the consumer to publicly align themselves with your brand. 1 Brand Alignment – Due to lack of experience, resources and professional marketing departments, many small local brands make the mistake of trying to be “cute”. This error establishes the wrong impression with customers from the beginning and can result in distrust. Don’t be cute, instead be effective by creating strong messaging that presents clear promises to your customers. It is crucial for local brands to set clear expectations of what your customer can expect when doing business with your company and understand the differences that make you unique. 2 Deliver on Promises – Research shows that when brands of any size deliver on their promises, consumers respond. On the contrary, this research also reveals that only 46% of managers and 37% of employees even know what their company stands for and what makes their brand different from competitors. Establishing credible and compelling expectations with customers upfront should also be evident through employee alignment with the brand, resulting in positive customer interaction. If leadership and staff don’t understand and/or don’t believe in the company message and differentiation it is nearly impossible for them to deliver brand alignment when the customer arrives. Since employees are the ones that have consumer interaction, it is crucial that time, energy and most importantly resources are funneled to thorough employee training. Whether or not your brand delivers on its promises, will determine if you create trust and establish long-term customer loyalty. 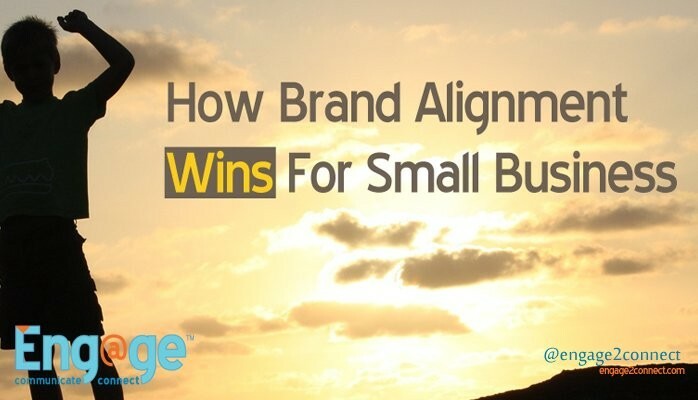 This defines your brand alignment and should be priority one for all small businesses. In fact, because small companies have fewer employees, they are far better positioned to deliver. Focus and prioritize employee understanding and alignment throughout the small business to ensure you are delivering it to your customers. 3 Relationship – Being a small business, you have a huge potential advantage surrounding customer relationships. The ability to understand local culture, contacts and nuances that big brands just can’t compete with should not be underestimated. Add to this a more nimble ability to engage your customers at a human and personal level, makes aligning your brand with the consumer easier for you than the bigger companies. Personalizing your marketing efforts and setting a priority for your staff to get to know your customers when they visit, can go a long way in furthering the longevity of your customer relationships. 4 Consistency Wins – There are two main areas small brands need to focus on regarding consistency. – Messaging: No matter where your logo, content and messaging appears, it needs to be consistent. This consistency comes in two forms 1) Actual message and promise and 2) Frequency. Whether it be social media, print advertisements or content marketing, small businesses often miss the need for consistency. If you are going to build brand awareness that connects with your audience, it is required to maintain consistent messaging with frequency. Repeating your unique value proposition, brand promise and differentiation is key to imparting your brand alignment story to your customer. – Experience: Though we have discussed delivering on brand alignment promises above, it cannot be understated how important it is to do this consistently. Every time your customer experiences your brand, whether it be in-store, online or elsewhere, you must deliver a consistent experience that is in-line with your brand. Failure to be consistent in customer experience has the ability to make your most loyal customers extremely cool and your new customers turning to your competition. 5 The Local Advantage – One of the most distinct advantages the small business has is the local factor. Whether it is signage, search engine marketing or word of mouth, the small business can out maneuver big brands in unique ways. Local search marketing and social media can be a significant leveler against the big brands when used properly. Combined digital marketing integrated with all other aspects of your marketing efforts should work in conjunction with your brand alignment. If you understand your big brand competitors, as well as your local competition, you can leverage clear messaging, brand promise and experiences to out execute them at every step. The new normal requires small businesses to compete more effectively with major competitors. The ultimate desire of the consumer is to do business with brands they can trust. Small brands that place an emphasis on consistently delivering on the promises contained in their marketing messages have the ability to beat big brands at their own game!